Sectional overhead doors open vertically upwards, creating space in front of and behind the door. Useful space is not wasted inside the building either because the door sections are parked underneath the ceiling or vertically on the wall. Since the doors are fitted behind the opening, the clear passage width can be used in full which virtually excludes risk of damage. To ensure that the main door does not always have to be opened to allow pedestrian traffic to pass through, wicket doors can present a practical solution. An optional trip free threshold is also available with wicket doors to reduce the risk of stumbling and injury. Alternatively, if there is space, a matching side door provides an economical and safe way of separating heavy employee and vehicle traffic as well as providing an escape route. 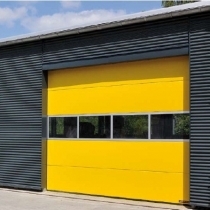 For added safety, all sectional doors are fitted with finger trap protection between the sections and the hinges, as well as a photocell safety sensor which recognises obstructions and stops the door as a precaution, reliably avoiding injuries and damage to property. > Stucco texturing features a uniform ribbing every 125 mm in the sections and section seams while the texture itself makes the door resistant to dirt and small scratches. > Micrograin features a smooth surface and characteristic fine lines with finely ribbed sections. In addition, double or triple DURATEC synthetic glazing is available, which has up to 20% or 30% better thermal insulation respectively, in comparison to 16 mm glazing and retains a scratch free view even after heavy use or cleaning.